Boy oh boy...do I wish I had all the answers to that one! Other than something happening to my horse my #1 fear at a ride especially at a longer ride (50 mile) is getting lost. Talk about the ruination of an otherwise great day! There have been two instances where I got lost and it cost me my ride. After spending months of preparation for both of those rides on different horses it was a terrible let down. The first time I got lost I had decided to start with the pack to try and position my horse nearer the front of the pack to try and get an alone bubble to ride in "somewhere in the middle" as the ride progressed. This was on Phebes, and we had managed to finish 7th on our previous ride with good vet scores, so I figured if I could position myself in the middle we'd have some sort of a shot at 10th-? depending on how the day went. Well----it didn't go too well. Putting her near the front at the start got her all worked up, and me focusing on control, and soon finding ourselves IN FRONT within a quarter mile of starting and me still trying to get some kind of reasonable control of her rate...so at a canter we blew right past the blue ribbon (at first light of the morning I can't seem to see blue) and we were off...following ribbons, blue ribbons, in THE WRONG DIRECTION. At this point in our education I was not aware the ribbons should always be on my right (except at a turn) and I wasn't the only one...another rider was hot on my heels and we trucked right on seven miles THE WRONG DIRECTION until we met up with the pack head on coming THE RIGHT DIRECTION. That was embarrassing, humiliating, and a big old learning lesson right there. Phebes by that point had herself so worked up that I was worried she'd have a metabolic issue, so I rode back to camp and took a rider option as I could not see her finishing the ride with a do over as torqued up and sweated out as she was. It was kind of a hard lesson, but I learned it. Phebes wasn't ready for middle pack, especially not be starting in the front group. Race brain took over and the day ended badly with getting lost, which was probably in our favor...chasing the front all day would have been bad. SOMETIMES LIFE DEMANDS that you refocus. important part of our empty nest years. We both compete mainly at the 50-mile distance but she does some LDs and I compete in some 100s. Sandy has a long list of autoimmune disorders that would leave most grandmas at home in the recliner. In September of 2013, I came into a vet check in a 100 and she was sitting in a chair with a bloody rag on her head. 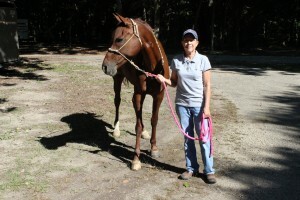 She had fallen and hit her head while walking her Missouri Fox Trotter, Samba, who had been pulled with a lameness issue. A couple of months later, we found out that Samba had EPM. It became so bad that you could push on the horse’s hip and it would almost knock her down. Samba had also lost hundreds of pounds and no amount of feed and hay would put weight back on her. world with that diagnosis. She was put on once-monthly immunoglobulin IVs. We treated her horse and we treated her. Cancer tends to run with this strange disorder and Sandy was found to have liver cancer too. Her medical team took out the cancer and part of her liver in February of this year. For a month she lived and slept in a recliner next to our bed. Sandy dreamed of getting outside and riding a horse again. I kept treating the horse and then training the horse with the help of friends. That’s not me. We stopped for happy hour at the creeks. The winners kept going. I just finished my first Endurance Ride. A caveat about what follows: It may sound like I’m whining. I’m not. But I wanted to give you a true glimpse into what it’s like to start this very tough sport late in life, and still survive. So France was an adventure. After my 2 days of flying right after Tevis I was really walking like a crippled person. It took a couple of days to work the kinks out. Jeremy had driven our two horses, Chanses and Gold Dust Rising to the USEF headquarters in New Jersey before the flight so they could be inspected one last time by the team vet. It was decided that both horses were ready for the trip and were a part of the traveling squad for Team USA. Jeremy flew with the horses while I flew by myself from California to New York to France. I arrived in New York late at night but the next day I met up with Meg Sleeper and Ellen Olson, two of my teammates. We had a good time in the VIP lounge, a little too good of a time! We almost missed our flight, and we were there most of the day! The flight was alright but we were all really disappointed that we had booked ourselves onto an over seas flight that didn't have personal entertainment. Darn. Lucky for me I was good and tired. We landed in France and found my rental car that we all piled into. The drive to our house we were staying in was about 4 hours away. Good times. We stopped and had a coffee on the way. Jeremy Reynolds, Jeremy Olson and Lynn Kennely arrived with the horses and got to the B&B late that night. It was good to see Jeremy and hear how the horses were doing.